Undergraduate aerospace engineering senior Alexis Zinni is gaining real-world engineering project management experience while serving as the student director of the Texas Spacecraft Lab. View more photos of students working in the TSL. Since the Texas Spacecraft Laboratory (TSL) was established in the Department of Aerospace Engineering and Engineering Mechanics in 2002, students have been involved with small satellite missions in the Cockrell School of Engineering. From designing and building satellites, to preparing them for launch, to operating them from an in-house ground station once in orbit, these students have been gaining crucial real-world experience that has not gone unnoticed by future employers in both industry and government alike. Currently under the direction of ASE/EM assistant professor Brandon Jones, the overarching goal for the undergraduate student-driven research group is to perform space-based experiments while developing and demonstrating new technologies through hands-on projects in a collaborative, interdisciplinary environment. The current 60 or so TSL members come from a variety of engineering disciplines including aerospace, electrical and mechanical, as well as a handful computer science majors. Aerospace engineering senior Alexis Zinni began serving as the TSL student director in July of 2018. Traditionally, the TSL has been under the direction of a professor or doctoral research associate, so serving in this role as an undergraduate student is quite an accomplishment. Zinni has been involved with the TSL through much of her career as an aerospace engineering student and has also served as the student program manager of ARMADILLO – an award-winning satellite mission – since 2017. According to Zinni, her role as student manager of the lab is modeled similarly to how engineering projects are managed in industry. Each mission begins by writing a proposal and sending it to their sponsor, such as NASA, USAF or the Jet Propulsion Laboratory, usually as part of a competition entry. The next step involves developing the software and hardware of the proposed satellite, which may take years depending on the complexity of the mission, allotted time and the skill of students. The mission reaches its official conclusion after the satellite is successfully launched into space and guided to complete its task from the UT ground station. Whether a mission is considered successful or not, TSL members gain valuable engineering skills while working on these missions – the kind of skills that many employers are looking for in their new hires. The authentic experience of working in the TSL is part of what makes Zinni grateful to be the undergraduate student director. “The TSL has a special place in my heart — my dream has truly become a reality. 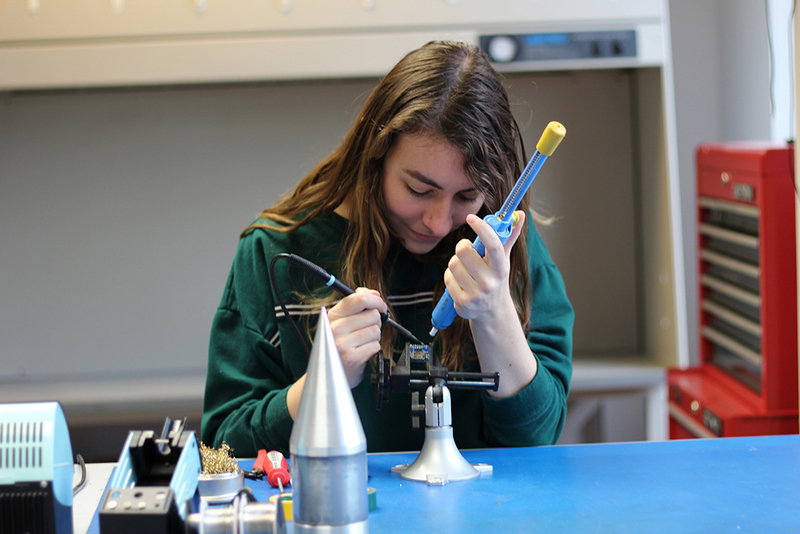 I have soldered objects that will fly in space, and the students and I are going to operate a spacecraft from the ground as undergraduates – that’s something that most people will never get to do,” she said. In addition to the ARMADILLO satellite which is scheduled to launch this spring, TSL is collaborating on several other missions including Seeker-1 with with NASA-JSC, SERPENT with AFRL, and HyperSciences, a new collaboration with the Austin-based start-up. The group is also partnering with the newly established Texas Rocket Engineering Lab to develop a payload for an industrial-scale rocket. For more information about TSL, including launch dates and recruitment information, visit their website.